Earn yourself £5 Free Bets every single week valid for across many leagues with Premier League Free Bets! Make a bet that’s worth £20 (or more) on a weekly basis and William Hill will credit your account with £5 Premier League Free Bets! This offer goes on until the end of the 2016/17 campaign and you can use it on a range of different football leagues. So what are you waiting for? Bet now and collect yourself £5 Premier League Free Bets every week until the season comes to a close next year in May. Assemble a bet slip with the best selections and wager £20 any time between 00:00 Friday and 23:59 Thursday to qualify for the Premier League Free Bets! Online sportsbook William Hill will accept wagers on many betting markets including: 90 minutes, Both teams to score, Anytime goalscorer, Double result, Correct score and lots of other markets. The Premier League season kicks off this Saturday (August 13) with a match between Hull City 3.80 (14/5) and defending champions Leicester City 2.00 (1/1), which will be followed by Everton 2.87 (15/8) vs Tottenham 2.37 (11/8) and Man City 1.22 (2/9) vs Sunderland 13.00 (12/1) later in the day. And then on Sunday (August 14), Bournemouth 4.60 (18/5) will receive a visit from Man United 1.73 (8/11), and last season’s runner-ups Arsenal 2.20 (6/5) will open their 2016/17 account with a cracker against Liverpool 3.00 (2/1) at the Emirates. On Monday evening, Chelsea 1.61 (8/13) will host Slaven Bilic’s West Ham 5.50 (9/2) at Stamford Bridge in what is looking to be a thrilling match between the two. Make a bet slip, bet £20 and earn yourself £5 Premier League Free Bets every single week during the 2016/17 campaign. 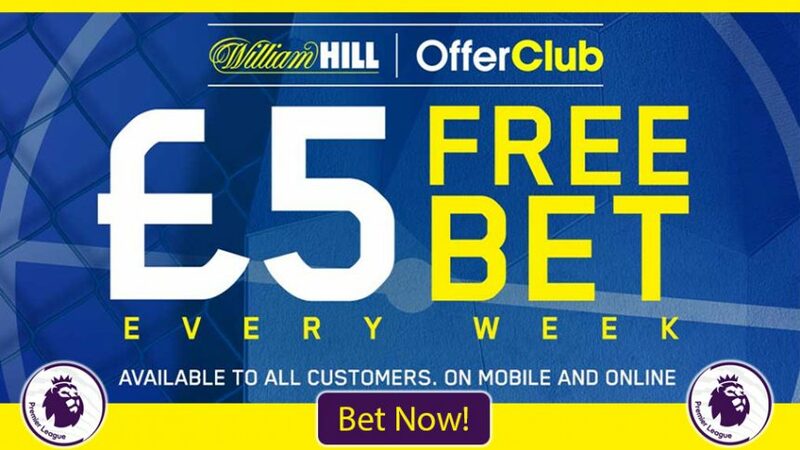 Claim your £5 in Premier League Free Bets!